Gemstones glittering on tiaras, hand-beaded and embroidered dresses, smooth waves of sheer organza—”Costuming The Crown” will make you wish you were one of the royals as you stroll around the exhibit. I’ve been a wide-eyed admirer of TV and film ever since I was a little girl, watching in amazement as Harry, Ron and Hermione performed spells and met magical creatures in the world of Harry Potter, or as Tony Stark became a superhero and blasted across the big screens as Iron Man. So when my sister called to tell me about an amazing new Netflix show that was a dramatized historical account of Queen Elizabeth II, I knew I had to check it out. I immediately binged the first two seasons in just under two weeks. The Crown is both beautifully produced and engaging to watch. Grand and lavishly designed sets are complemented by intricate narratives and character arcs that tell the dramatized true accounts of the British royal family. Like the rest of the show’s commitment to excellence, the costumes are perfection—regal and so historically accurate they transport you back in time. And it’s these costumes from the actual TV production that are the highlight of “Costuming The Crown.” Costume designers Michele Clapton and Jane Petrie (season 1 and 2, respectively) worked with Winterthur to showcase their award-winning costumes in this exhibit, all while sharing insight into their designing processes on the plaques around the exhibit. In four parts, the exhibit walks visitors through the significance of the costume design in The Crown. Sweeping gold robes over a crisp, pleated white dress greet you as you enter the exhibit. Off to the side, the crown, sceptre, glove and ring Claire Foy (who played young Queen Elizabeth) dons during the coronation scene glimmer. Beside the Queen’s coronation gown rests Prince Philip’s (played by Matt Smith) robe. 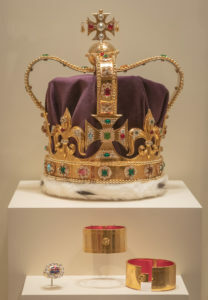 The first part of the exhibit focuses on the ceremony and rituals the Queen must undergo to take on the duties and responsibilities of her role. Likewise, the actors had to establish themselves in the roles of their royal counterparts. And this is where the costumes became so crucial. The clothing had to be elegant and yet faithful to what the royals actually wore. At their core, the costumes in this part of the exhibit are replicas of the originals, rather than newly made designs. 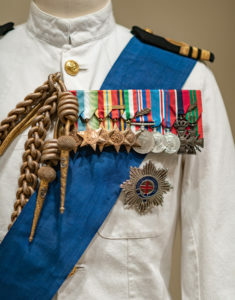 Stately naval uniforms, decorations and medals, the Queen’s and Princess Margaret’s wedding dresses, the dress worn by Elizabeth upon her return to London after the King’s (her father’s), death—these are all costumes in the second part of the exhibit. 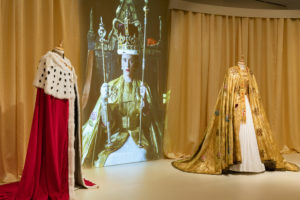 Like the gown from the Queen’s coronation, these costumes had to be replicated from clothing that was widely known and recognizable from television and photographs. This already-challenging task was made more difficult by the need to make the costumes attractive to contemporary audiences. 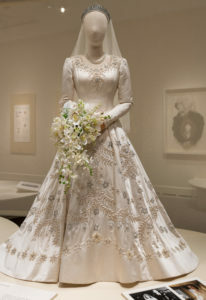 On a placard, costume designer Michele Clapton shares how she had to decide between authentic or attractive when creating the replica of the Queen’s wedding dress. Clapton recognized that the original style would have been glamorous at its time, but some alterations to make Foy look glamorous would better tell the story of Elizabeth. Unlike costumes in the first parts of the exhibit, those in the third part are not replicas or based on historically documented clothing. 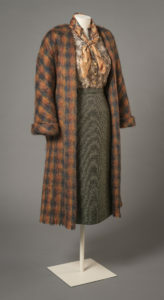 “Creating Character” looks at outfits worn in private moments of the show—in family life or in dramatized moments not based on historical facts. One such outfit is worn by Vanessa Kirby (Princess Margaret) in the second season, while on the back of Antony Armstrong-Jones’ (Matthew Goode) motorcycle. Coincidentally, designer Jane Petrie revealed at the exhibit’s Press Preview that it’s her favorite in the exhibit. This costume is one Petrie had more creative freedom in making, since she didn’t need to replicate an outfit from a photograph. When you visit the exhibit, look for the duplicate jacket like this that’s on display, too! At the Press Preview, Petrie revealed that the second jacket was made later, using the same type of fabric from a different distributor. It was worn by Kirby’s stunt double. 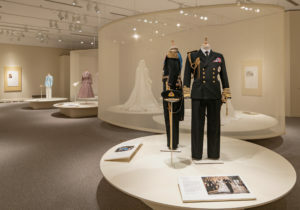 The final part of the exhibit features clothing and costumes worn by the royal family in their official images. Historically, royal photographers took carefully constructed and edited images of the royals, controlling the image the public sees. Similarly, in scenes in The Crown when the royal family are taking official photographs, the costume designers created costumes that were again accurate, and also accentuated the status of the royal family. On display here is the dress worn by Vanessa Kirby to portray Princess Margaret’s 19th-birthday portrait. Designed by Petrie, this dress was another that had been widely published and therefore well-known. By looking at photos of the original dress, Petrie designed this “quintessential princess dress.” In The Crown, Kirby wears the dress off the shoulder to show a bit of Princess Margaret’s personality. Kirby also wears a replica of the Cartier Halo Scroll Tiara, though the real Princess Margaret never wore it for these portraits. This tiara was one Princess Margaret was known to wear regularly, so it was included in the show for Kirby’s portrait. “Costuming The Crown” also includes notes and photographs by Henry Francis du Pont and wife, Ruth Wales, from the period when they saw Queen Elizabeth either on TV or in person. 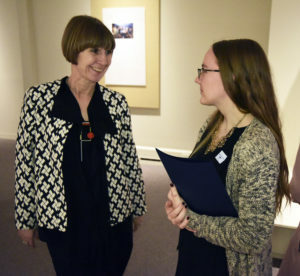 Jane Petrie and I at the Press Preview in March, 2019. Before you leave, stop in to check out the gift shop, which has books, tea and an abundance of Corgi-related souvenirs. In its first two seasons, The Crown has won 8 Primetime Emmys, including Lead Actress, for Claire Foy in Season 2, Best Supporting Actor, for John Lithgow in Season 1, and Outstanding Costumes for both Season 1 and Season 2. Tickets: 800.448.3883; Winterthur.org. Senior and student discounts.